the fish-hooks from your holiday. All you do is ride your motorcycle and enjoy. 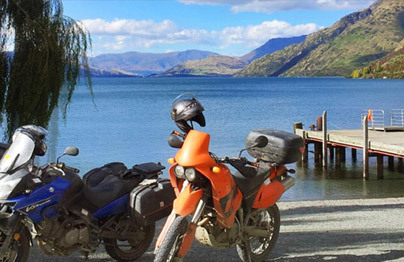 How does a New Zealand Self Guided Motorcycle Tour work? your special preferences and needs. 10, 14 and 18 day packages – all you do is pick the package that suits you and leave the rest up to us. You can read more about these on our Pricing page – click in on Pricing link on the left hand side menu. With a GoTourNZ.com Fixed Itinerary Self Guided Tour, you simply choose from the menu of pre-prepared itineraries on the Pricing page. It’s a bit like choosing the buffet option at a restaurant. With a GoTourNZ.com Custom Self Guided, it’s a bit like having a personal chef cook a special meal for you, just to your liking.Upon contacting us and booking your Custom SGT, you’ll be asked to complete our pre-tour survey (which gives you a chance at a winning our Free Tour Prize), and letting us know your preferences, likes, dislikes etc. (e.g. food, accommodation preferences, interests, level of fitness etc). Once you’ve filled in our survey, we can tailor an itinerary that suits your preferences – if you’d like to sample the best Kiwi farmstays and walk some of our famous national park walkways, or perhaps scuba dive, or play golf, we can put together a package that concentrates on these aspects. Given this information we then spend a considerable amount of time designing, and handcrafting and tailoring a personalised itinerary just for you, but in many ways very similar to that given to those who choose our NZ Guided Tour option. We then email the outline back to you for your approval, and after you’ve approved, we finalise the booking and preparation of your itinerary. You’ll get a full briefing before you set off on your personalised motorcycle odyssey, plus maps, our personalised and detailed itinerary “Bible” (usually over 60 pages of specially prepared info) and information on alternative routes and things to do. Over the duration of your Self Guided tour we stay in touch with the places you’ll be staying at, just to make sure that all is going as planned. We’ll even contact you during brekky just to ask if all is well. We can book accommodation, meals and activities in advance for you, a ferry crossing – even a Church and celebrant if you want to renew your wedding vows (been there, done that..) . In case you need to contact us urgently, we’re only a Toll Free telephone call away (7 days, 24 hours). We don’t just take your money and leave you to it – we watch out for you every day you are here. We have selected farmstays, homestays, B & B and hotels where we have found the operators to be particularly helpful and personable. 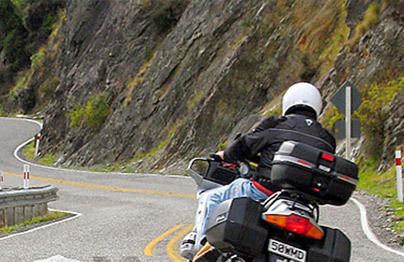 Our Self-Guided Motorcycle Tours (SGT) are for those who want to be sure they’re not going to miss out on the best roads, the best sights, the best activities, the best restaurants… but who don’t feel they want a guide. Think of them as a Monty Pythonesque package – a Guided Tour without the Guide (remember the Spam Sandwich skit?). You won’t have to worry about missing out on the best accommodation, the best restaurants, the best roads and scenery… and, perhaps more importantly, you won’t have to worry about the bad restaurants and accommodation. It all flows together seamlessly without stress of having to rush. We spend each and every off-season looking for new places for you to stay, checking that our old favourites are still up-to-par and the hosts still on-the-ball and not burnt out. The daily touring notes give you maps, distances, alternative routes, contact information for your accommodation, where to stop for the best food and coffee, activities you’re booked onto. The best activities and restaurants can be booked out 2 – 4 months in advance. 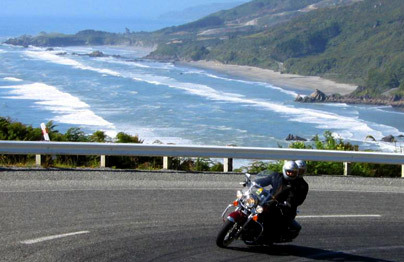 By allowing us to prepare an NZ Self Guided Tour for you, you’ll avoid disappointments. You’ve travelled too far to take a gamble.. We can provide you with a Custom Self Guided Tour of any length to suit the time you have available – if you’re wanting to weave in some off-bike activities, like golfing, skiing, diving or hiking ,or perhaps some very special off-the-beaten track lodgings, and you’d like all this woven in to your motorcycle tours, then this package could be for you.